This blog has always been about open source software and usability. My primary reason for my writing the blog is practical experience towards my M.S. degree in Scientific & Technical Communication, where my thesis will be about usability methods applied to open source software. In Fall semester, I conducted a limited usability test of three open source software programs: Gedit, Firefox, and Nautilus. These tests allowed me to discuss at some length the practical approach to apply usability methods in open source software, including some of the results I derived from the usability testers. So it would be somewhat amiss of me to not comment on a recent new version of a prominent open source software project: Fedora 18. This is a full release of a Linux distribution that is built completely from open source software. Arguably, the most prominent component of Fedora 18 is the GNOME desktop. 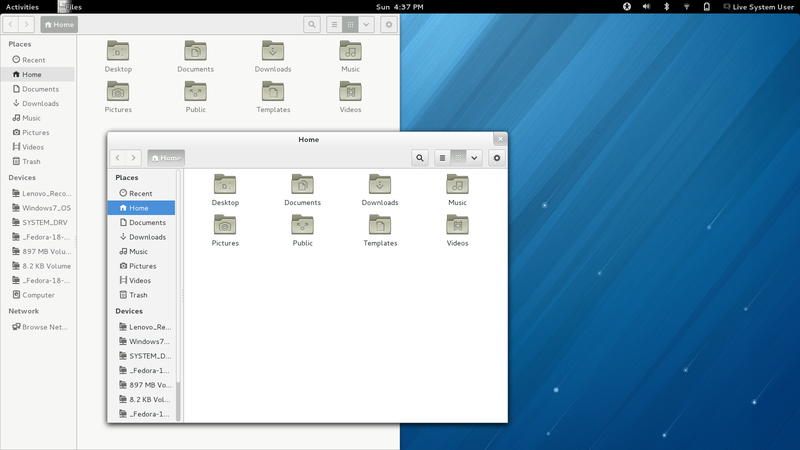 Fedora provides different "spins" of their distributions, and the default "spin" uses the GNOME desktop. I installed Fedora 18 on a 16GB USB stick over the weekend. I'm not very impressed. I'll leave it to others to comment on the full install process, which got a major facelift in Fedora 18. (I wrote the Fedora 18 distribution to a "live USB stick" so I didn't go through the new install process.) However, I can comment on the the usability of the desktop. You can immediately see that the updated GNOME desktop in Fedora 18 doesn't do well with two of the four themes of successful usability: "Consistency" and "Menus". Where are the menus? There is no "File" menu that allows me to do operations on files. There is no "Help" menu that I can use when I get stuck. The new Nautilus doesn't have a menu, but other programs in Fedora 18 do. The new Gedit text editor (which is also part of Gnome) still has menus, but the file manager does not. I don't understand why. The programs do not act consistently. And things get worse when you compare the two Nautilus windows in the screenshot. When you maximize a Nautilus window, either to the full screen or to half of the screen, the title bar disappears. Look again at the screenshot and compare. The "x" button in the upper-right corner (to close the program) disappears in the maximized view. How do you exit the file manager after you've maximized it? For that matter, how do you "un-maximize" the file manager, to return Nautilus to just a regular window? As somewhat of a "power user," I'll also complain that I can't figure out how to connect to a remote server. This used to be an obvious action under the "File" menu, but without a menu in the new file manager, I can't do it. The only clue I have to connect to a remote folder is under "Network" - "Browse Network" at the bottom of the left pane. But this only lets me see my local network, and the server I want to connect to is hosted elsewhere. I think I'll keep clear of this release and see if things get fixed in Fedora 19. But as an experiment, I may try out a different "spin" of Fedora 18, perhaps the "XFCE" or "LXDE" lightweight desktops. I wanted to share an example of how usability methods are applied in projects. At the University of Minnesota, we are working to upgrade the core PeopleSoft system which manages (among other things) our student records. Per yesterday's project update, the new "portal" is using student perspectives to inform the design. I've written before about scenarios in usability testing. Usually when creating an information project, you would start by describing the people who are likely to use your product, and what they need to get out of your product. These are called user personas and are very helpful in generating a common understanding with everyone on the project about the users and their goals. To make the personas more concrete, you should include photos of people who look like the users you describe. (Stock photos are fine as long as they are casual, and always make sure you have permission to use the photo.) Photos put a human touch on the personas. Usability consultants were approached with a question: what will students want from a single, unified student portal? There are any number of options, features, or ways to present all the information available to students. So, the usability consultants team got together and researched techniques to assess user satisfaction, and prioritize the options the team had in mind. I'm glad to see usability methods being applied in this project!